Depending on the order type and the time of day, a player may have the capability to cancel an order from being executed. Please realize that limit and stop orders can always be canceled prior to execution. Due to the nature of how basic market orders are supposed to behave, they cannot be canceled. The only exceptions are for MARKET OPEN orders (A special class of market orders that are made when the markets were closed for trading), which can be canceled before the markets open for trading. We will now go through an example about canceling an existing buy limit order for Microsoft (Nasdaq:MSFT) (If you need to review how to make a limit order, click here). First, click on the trade tab. 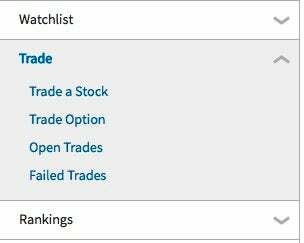 Click on the Open Trades link that appears in the area below the tabs. Finally, Click on the corresponding "cancel" link (in this case, its the one for MSFT) to initiate the cancel. In the case of limit and stop orders, cancellation does not happen instantly. It will typically take around 20 minutes from when the cancel request is initiated before the order will be removed. If the target price is met during that 20 minutes, the order will still go through. Market open orders, on the other hand, will be instantly canceled when the cancel command is selected. Netflix (NFLX) may have just canceled the hip-hop drama “The Get Down” after reportedly paying $120 million for the first season, but no one at the firm is losing sleep over it. Do Netflix's Show Cancellations Affect Its Bottom Line? The online video streaming service has canceled four shows in the past seven months.